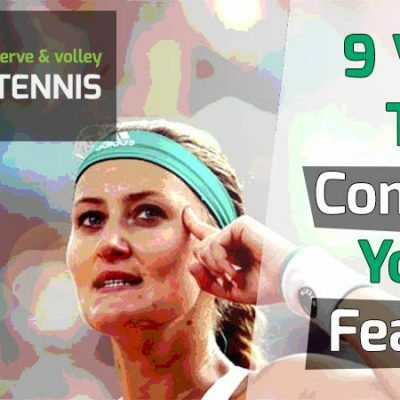 Do you want to generate more topspin on your tennis shots? Well, I’m going to discuss all the ways you can do that in this post, so make sure to read all the way through. To me, personally, I feel like players fall into one of two categories. They’re either topspin hitters or flat hitters. If you’re reading this post, you’re most likely a flat hitter who wants some topspin in your game. I consider myself to be a flat hitter, and there’s nothing wrong if you are one too. But it seems like nowadays everyone wants more topspin on their forehand and backhand. Perhaps we’re all mesmerized by Rafael Nadal. We hear about the awesome RPM (3000+) he generates on his shots and want some of that too. So why is topspin important? Topspin makes the ball stay in the court and gives the ball more margin for error over the net. It also makes shots more difficult to return, as the ball bounces higher and accelerates off the ground. The only drawback to topspin is that the ball moves through the air slower than flat shots. This gives the opponent more time to get to the shot. Often, I can get to topspin balls hit out of reach. But flat shots that stay low are problematic. However, flat shots are not easy to hit, which is why all professional players hit with topspin. So remember: Hit with topspin in tennis to improve your game. All pros use topspin shots, even though flat shots can be more powerful. Here’s how. You don’t need to master every attribute on my list to hit topspin. But all of them are key contributors in one way or another to generating spin. I have my own unique theories on each one, which I’ll share in a second. By the end of this post, you’ll have a good idea of how to generate more topspin in your tennis game. There’s no time to waste. So let’s begin! Can a change in grip on the forehand or backhand produce more spin? Yes, absolutely. That’s why the biggest topspin hitters on the pro tour use semi-western and western grips and not the eastern grip. Grip matters because a slightly closed face at contact (like western grips produce) will impart spin to the ball. (You can learn the different grips here). 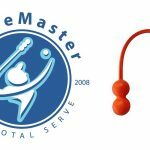 Does a western grip guarantee you’ll hit massive topspin? No, definitely not. Why not? Because there are other factors involved with hitting topspin. Grip is one attribute that helps. But by itself, it won’t produce massive topspin. It is a foundation which while essential, is not adequate on its own. For me, the eastern grip is what I prefer. However, I notice that when I hit with the semi-western grip, I can dip the racket head more, which is a key attribute in generating more topspin as well. I’ll get into this more in the next section. For now, I’ll say it’s easier to drop the racket head below the hand from the semi-western grip. This creates more of a brushing effect on the ball, producing more spin. If you use an eastern grip, don’t worry. You can generate topspin with that grip. The good thing about the eastern grip is it’s easy to flatten out your shots, which is important at times. My conclusion on grip is that you can generate spin from either eastern, semi-western or western. However, the western grips are easier to work with when trying to generate a lot of spin. Almost all good coaches and academies start their students with the semi-western grip. Older folks will most likely hit with eastern grips. But all can generate topspin if the other concepts are utilized. Let’s go onto the next one. Since the advent of youtube, I’ve been able to study all the forehands of the top professional players, such as Federer, Zverev, Murray, Nadal, Djokovic, etc. From what I see, almost all of them have their racket face or strings pointing down in the slot position. I believe this is an important contributor to topspin. The slot position is the final point the racket stops during the takeback on a groundstroke before making its forward movement. Most players take their racket back high and drop it into the slot position. From there, they move the racket forward to contact the ball. I noticed from my own play, that when I keep the racket face pointing down in the slot position, it automatically puts the racket in a great position for topspin when I swing to contact. I think it’s because it creates a lag with the racket head and angles the face down more than if the head is not faced down in the slot position. Almost all the men on the pro tour hit like this, so much so that this is known as the modern ATP forehand. However, 90% of the women on the WTA tour are not using this method to hit, as it requires a take-back rather than a loop. If you’re curious to know more details on this, check out the blog post I wrote on ATP forehand vs WTA forehand. If you want to generate more topspin, try facing the racket head down in the slot position. I must warn you that it may feel strange if you’ve never done it before. This is because you may be used to aligning the strings to the ball like is done in a pendulum swing. However, with practice, you can make it feel more comfortable and make it work. The other part of this is getting the racket head to drop below the hand. Even if you don’t face the racket head down, you need to drop the racket head below the hand or it’s almost impossible to generate massive topspin. As I said earlier, the semi-western and western grips are fantastic for allowing a deeper drop of the racket head. I think it has to do with the position of the hand. On the eastern grip my hand is kind of blocking the racket handle from dropping. But in the western grips, there is less blockage and the handle can angle down. In summary, either keep the racket face down in the slot position or drop the racket head below the hand. The racket head must meet the ball slightly under the hand on contact for topspin to work. Click the picture to check the current pricing on Amazon.com. 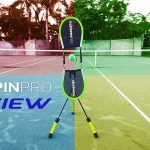 A perfect training device for learning to drop the racket head is the Topspin Pro. 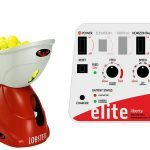 This device is fantastic for teaching players to brush on the ball. I use it often with my students. I find it works best with beginners and children. What I like about the Topspin Pro is that it gives instant feedback. If the student is not brushing correctly on the ball, it won’t spin forward. I’ll demonstrate how to do it and then let them try. If they still don’t get it, I have them use their hand only. Then they can try again with a racket. If they just can’t do it, I’ll move their racket slowly with my hand so they can feel what it’s like to brush from underneath the ball. Once they get the concept, it becomes a lot easier to hit groundstrokes with topspin. For this reason, I like using the Topspin Pro for a few minutes before each lesson, just to refresh the muscle memory of the student. If you learned tennis from a coach, you probably heard the phrase “swing low to high” more times than you care to think about. I think all tennis players have heard it at one time or another. This attribute mainly applies to traditional groundstroke shots. The truth is that swinging low to high does work for generating topspin. But it may not work in the way you are doing it. In general, we want to start our swing lower than the ball and finish higher. But we also need to extend our arm forward and not just low to high. For the average waist-high shot, a good topspin hitter may drop the racket 12-18 inches below the ball at the lowest part of the swing. And he may finish two feet above the ball, after contact. In all, the racket may be moving as much as three or more feet from the lowest point to the highest point. I highly suggest videoing your forehand and backhands. You may be surprised how little space exists between your lowest and highest point of the swing. If you lack topspin, you’re most likely swinging on a very level plane. Your mental image in tennis is often vastly different than reality. For that reason, you really need to video your strokes. If your swing is very level, you’ll need to consciously lower your swing and finish higher. One good drill is to start your swing with the racket face on or near the ground. As the ball approaches, swing up to contact. After contact, continue moving the racket upward into the follow through. At the finish point, the elbow of your hitting arm should be head height and pointing toward the net. This is a great drill to exaggerate the low-to-high swing path. It will help you to feel the correct swing path for generating more topspin. Again, this for traditional type strokes. You should start to see a difference in your spin using this attribute alone. 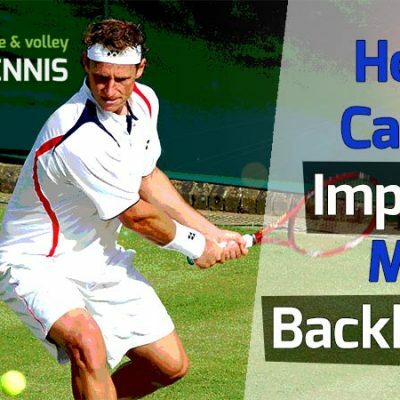 It’s absolutely proven to work for both forehands and backhands. 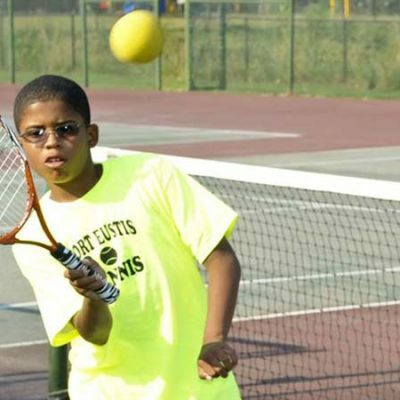 You may have never considered hitting in front of the body for topspin, but it’s important. I’ll explain how in a minute. But first, stand to your side with your arm straight in back, like you were going to hit a forehand. Your hand should be a little lower than waist height. Now move your arm as far forward as possible, keeping your arm straight. What happens? Your arm should automatically raise up towards your shoulder. This creates a low-to-high movement in the arm, ideal for topspin, as we just discussed in the last attribute. Now consider this. If we make contact too soon, which is close to the body, our arm will not have the necessary time or acceleration to impart maximum pace and spin on the ball. Think of a plane taking off on a runway. If the plane tries to take off 60% down the runway, instead of 100%, it may fail to lift. The same principle applies on your groundstrokes. For that reason, we need to hit in front of the body, where the arm is moving at maximum speed. Of course, the wrist will play a part too. I discuss the wrist later. Now, all this may be a revolutionary concept for you. 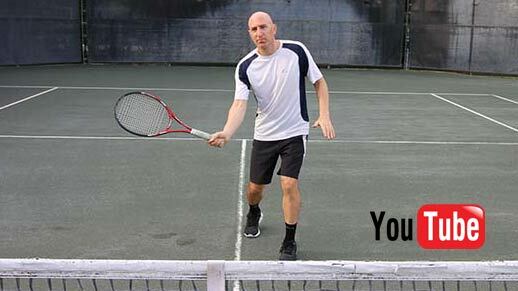 You may have never thought about hitting out in front of your body for topspin. You may also be having that “a-ha” moment like I did when I first thought about this. That’s the reason we hear good coaches tell us to hit in front of the body. We need to build up the arm speed and hit the ball as the arm is raising up. Hitting in front of the body translates to more power and a steeper angle of incline at impact, resulting in more topspin. This concept especially applies to the forehand and one-handed backhand. It’s true however, two-handed backhand players can make contact closer to the body because it’s a different stroke dynamic. I just want to point that out for the all the two-handers out there in case they are wondering. I found that hitting in front of the body is a little easier in the open or semi-open stance. However, it can be done in the neutral stance as well. Stand in front of a full-length mirror and practice the swing path without a racket and take note. Watch where your arm finishes extending. Optimally, you should contact the ball about 4-6 inches before full extension. This allows you to still have some forward movement on the racket after contact. Where the racket goes after contact is dependent on what height you strike the ball and how much spin you want to impart. On lower shots, you only need to come from slightly under the ball. For these low shots, you’ll raise your arm and finish near your shoulder. On higher shots (shoulder level) you can swing more level and finish on the same plane or even lower. You’ll still impart topspin by coming from a little under the ball. I know that sounds a bit confusing. Again, it depends on what height you’re striking the ball and from what location on the court. The main take away here is to hit in front of the body. There are a few major techniques for producing topspin. Pronation of the wrist is my favorite. When done correctly, the racket moves like a windshield wiper on a car window. Hence the name “windshield wiper forehand”. I love using this type of stroke to put massive spin on the tennis ball. It can be done on the backhand too, but to a lesser degree because of biomechanics. We just have more versatility on the forehand side. Of all the techniques I tried for topspin, the windshield wiper works the best for me. I can literally swing the racket as fast as I want and keep the ball in play. This is all done with the eastern forehand grip too. When I broke it down to its core component, I noticed the windshield wiper is just pronation of the forehand with the wrist/racket combination coming along for the ride. It’s important to stress that the wrist needs to be completely laid back (extension) before approaching the ball. This is essential for making this shot work. If no extension is present, the spin will be severely compromised. Soon after contact with the ball, the wrist will probably move to a neutral position (between extension and flexion). Don’t confuse that with pronation though. Let me explain how to do the windshield wiper forehand. Swing with extension and make contact in front of your body. Once contact is made, the forearm will pronate. The hand and racket will thus make a 180-degree flip (approximately) going from right to left (for righthanded forehands). As you swing the racket, the strings will move past your face (your arm will be almost fully extended in the front of you). I call this the reverse mirror because the opposite side of the hitting strings are facing you after contact (but only for a fraction of a second). The hitting side of the racket will face your opponent (again, for a split second) as it moves to the follow through. If all this sounds confusing, don’t worry. Look at the pictures and the video I made. You can check them out for clear visuals. Trust me, if you lack topspin, the windshield wiper is a great way to do it. And in my opinion, the easiest. Upon first trying this stroke, it will take time knowing when to pronate the forearm. Pronate too soon or too late and it won’t work. But once you get the timing, it’s a very powerful technique for generating lots of topspin. The one drawback is that the ball moves through the air slower (than a flat shot) because of all the spin. But if you have good racket head speed, you can still hit speeds in excess of 70-80 mph. This is plenty fast at the club level. 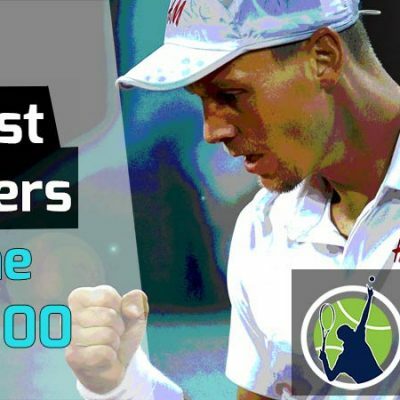 The very fastest hitters on tour (both men and women) average between 72-80 mph on their groundstrokes. Slower, looping shots with lots of topspin deep into the court can be very effective. Don’t forget that. 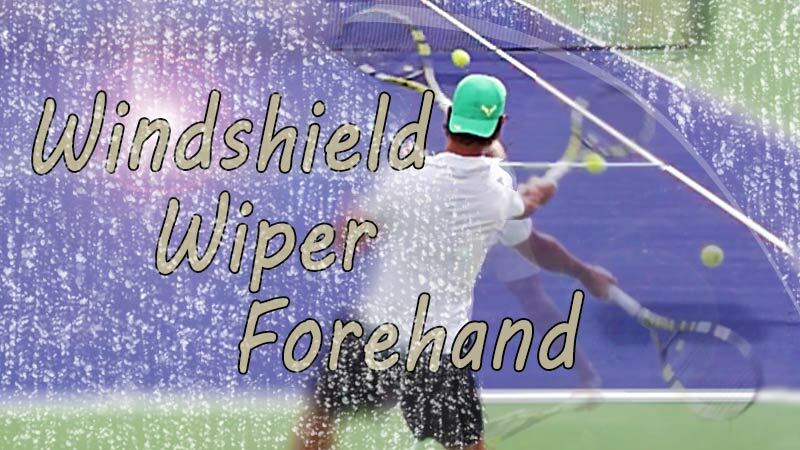 Some popular questions about the Windshield Wiper Forehand are answered here. A major reason for lack of power and topspin is slow racket head speed. I think many beginner and club level players are afraid to hit out, so they swing slower than they’re capable of swinging. They think by moving the racket slower, they can control the ball better. However, sometimes the opposite is true, as a slower swing means less spin. And less topspin can mean the ball is more likely to fly out. I feel like there are two parts to this equation. First, is achieving maximum racket head speed. Some people just can’t swing the racket fast enough to generate the massive amount of topspin the pros do. Second, even if a player can achieve high levels of racket speed, the fundamentals of the swing need to be in place for the ball to have hopes of consistently making it into the court. So there’s really two parts to this equation. A good player needs to have proper stroke mechanics and swing fast to produce great spin. When you combine both you can hit topspin shots that jump off the court with tremendous speed. Ever see Nadal’s put away forehand? Let’s suppose a player has good stroke mechanics but doesn’t swing fast enough to generate the level of topspin he or she desires. What now? Well, there are small hacks the player can use to increase racket speed, but it will only be a slight improvement. I believe every player has their own racket speed limit. Some people just swing faster than others. The good news is that even if you swing on the slower side, by using proper mechanics, you can still generate topspin. If you look at the pro tour, particularly women’s tennis, you’ll see a variety of hitters. You have those players like Caroline Wozniacki and Agnieszka Radwanska, who are known for their consistent strokes. They swing fast enough to hit good shots, but not as fast as players like Karolina Pliskova or Dominika Cibulkova, who are massive power hitters. If you swing on the slower side, work with what you have. Be the consistent player who is smart and uses placement. 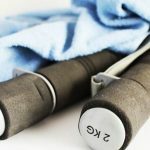 Work on improving your swing speed day-by-day by using resistance weights, like the racket weight along with racket speed drills. If every player on the ATP tour could hit topspin like Nadal, they would. But they can’t. Don’t worry if you can’t achieve massive topspin on your strokes. A little is all you need to be effective at the club level. I tell you this from experience. A few years ago, I was curious to know how Roger Federer and the other professionals of men’s tennis generated topspin on their hard forehands. I watched slow motion videos of them hitting and was really surprised at what I saw. I thought for the longest time that only swinging low to high produced topspin. I was wrong. I saw the pros hitting the ball fairly level but closing down the racket head at contact. This produced topspin without having to hit low to high. It was quite a revelation. I tried it the next time I played. True to form, it worked. If you hit with a slightly closed face and turn the racket head down after contact, you can still generate topspin on a hard shot. Most people who are flat hitters subconsciously turn their racket face down but don’t generate much topspin. This is because the angle of the racket must be slightly closed at contact (about 10-15 degrees). Flat hitters at the club level often have a neutral racket face at contact, which is why they miss so often. I teach tennis and study the game closely. I like to watch all the different variations people have in their strokes. But one common mistake I see is failing to close the racket face after contacting the ball. If you want to produce topspin on a hard shot, I think it’s essential the racket face immediately start turning down after contact. To be crystal clear, I mean the hitting side of the racket will turn to face the ground soon after contact. Once it does, simply extend out as far as possible and bring the racket straight across the body until you hit the follow through. This can be done on both the forehand and backhand. It works especially well on short balls taken above the shoulder. In fact, if you don’t close down the racket face, you’ll likely miss those high, short balls. The next time you take to the court, try it out for yourself. Watch the video above. Video your own strokes and watch them in slow motion if possible. Pay close attention to the angle of your racket on contact and how it moves across your body after contact. 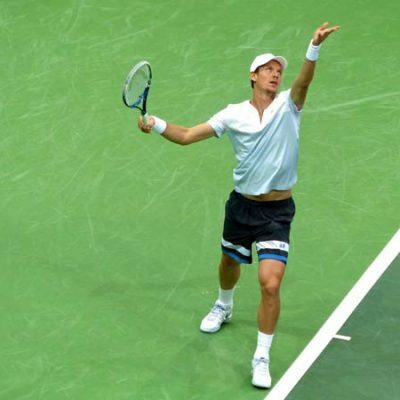 The follow through is important for one main reason – it maintains racket speed. If you don’t follow through on your groundstrokes, the racket will lack the speed to impart spin and pace on the ball. I know it may seem unreasonable to think that follow through has anything to do with the speed and spin of the ball. After all, once contact is made with the ball, who cares what the racket does? Unfortunately, that’s the actually not how it works. Tennis is a magic game and what the racket does after contact absolutely affects the behavior of the ball. For that reason, we need to have a strong follow through on every topspin shot we hit. Whether we finish low (by the hip), in the middle (near the ribs), or up high (over the shoulder) makes no difference. What matters is finishing the swing on the opposite side of the body. That is unless your name is Rafael Nadal; only he can get away with breaking the rules. One more thing about follow through. It’s very important there’s no slowing down of the racket or hitches during the stroke. Once you begin forward movement of the stroke, don’t stop or slow the speed of the racket. Keep the racket accelerating fast. Move it right through contact to the final stopping point all at the same speed. This will aid in imparting maximum spin on the ball. All of the aforementioned attributes have to do with physical swing mechanics in one way or another. This one is different. It involves only your racket. I mention it because you may have all the other attributes in place, but you lack the necessary spin to keep the ball in play. Maybe your ball is floating a little long or you just don’t feel the racket biting into the ball. Whatever the case, it may be your strings to blame. 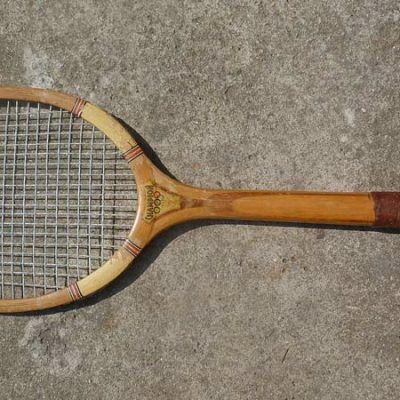 This is the reason why professional players use several rackets or more during a single match. If even a few pounds of string tension is lost on a racket, it can result in less spin and more balls hit out. Not only is it important to have the correct strings for spin, your strings also need to be tight enough to generate it. I personally use a 16L and 17-gauge polyester hybrid in my racket strung around 63-64 pounds of tension. 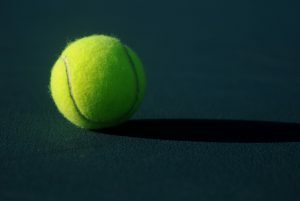 The string has a hexagonal shape to it which grips the ball better than the common round shaped string. 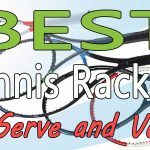 If you want to read more about which tennis strings you should be using you can check out my detailed post here. If you heed my suggestions and go with a good polyester string, be aware it will cost a bit more and the strings won’t last as long. However, you may be able to put more spin on the ball than ever before. My final recommendation is to try these things out. Experiment with changing the grip, how you orient the racket in the slot position, the swing path, the windshield wiper forehand, etc. Use what works and throw away the rest. For me, I like using the windshield wiper stroke on both the forehand and backhand. 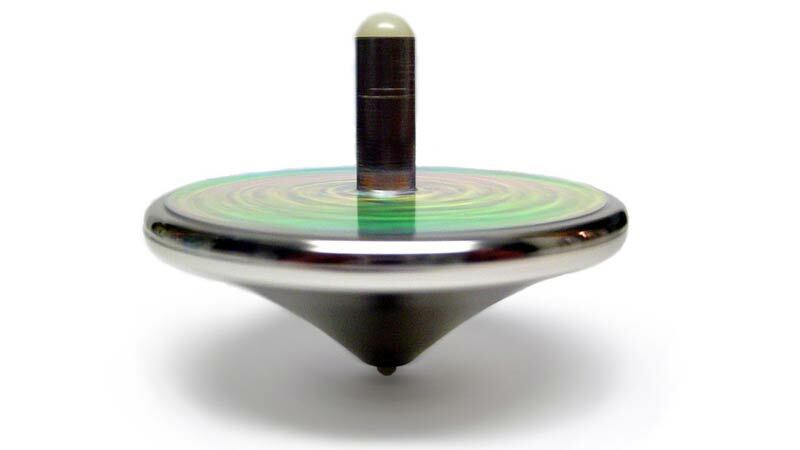 I find it easy to generate spin with it and it’s comfortable. When I want to hit harder, I just close down the racket face. This makes tennis easy. I have two basic variations for my shots: the windshield wiper for maximum topspin and a closed shot for more pace. I use both during matches. I even have a hybrid where I move my racket halfway between each technique (windshield wiper and closed shot). This gives me topspin and pace. Let me know if you have any questions about this post. I’m happy to answer them for you. If not, I’ll see you in the next one. Should I Teach My Kids The Serve And Volley Game?